Some doctors complain they don’t have sufficient stocks of vaccines. CHITILA, Romania (AP) — An outbreak of measles in Romania has killed dozens of infants and children, with 200 new cases reported each week. Doctors say the surge in the disease is fueled by the country’s low rate of vaccination. Some Romanian celebrities have waged media campaigns warning about the perils of immunization, and local superstitions such as keeping the vaccine-preventable disease at bay with cabbage juice or not cleaning one’s house have also exasperated doctors. Some doctors also complain they don’t have sufficient stocks of vaccines. Some 13,700 people in Romania have contracted measles since the epidemic began in 2016, and 55 have died, of whom only one had been immunized, according to the National Center for the Supervision and Control of Transmissible Diseases. The European Center for Disease Prevention and Control said the number of measles cases across the continent tripled last year, with Romania, Ukraine and Italy the worst affected. Alexandru Rafila, a laboratory chief at the Matei Bals National Institute for Infectious Diseases in Bucharest, told The Associated Press this week that the highly contagious disease is spreading quicker in Romanian because millions of its citizens work abroad, get exposed to different strains of measles and then return home. He said the disease first appeared in a community of Roma in northwestern Romania in 2016. He said that strain was foreign to Romania but often found in Italy. The World Health Organization recommends a 95 percent level of vaccination for measles but Romania has one of the lowest European rates — less than 84 percent. Doctors like Rafila are also up against celebrities like Olivia Steer, a television personality who publicly promotes an anti-vaccine stance. Steer declined to speak about her views to the AP. Research published 20 years ago that linked the vaccine to autism has been discredited but the scare has made some people wary, Romanian doctors told the AP. 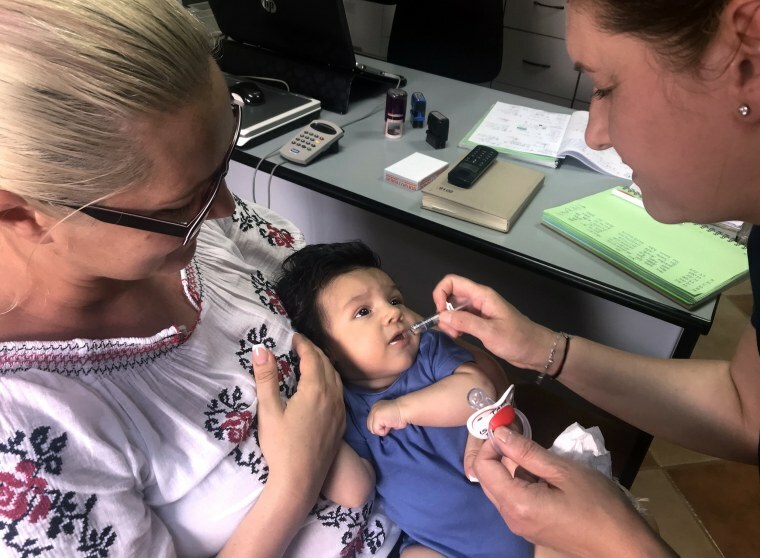 In Chitila, a small town just north of the capital of Bucharest, Dr. Daniela Stefanescu, a pediatrician, was vaccinating babies against measles and other viruses this week. The vaccine provides immunity against measles, mumps and German measles and is administered to 1-year-olds with a second dose a few years later. Stefanescu said the high number of deaths from measles made people who were initially skeptical about getting the vaccine reconsider. “Some of them said ‘Let me think about it. Maybe I’ll have it,’” she said. Stefania Pena, 28, had her 1-year-old son immunized, despite having doubts. “I read about children dying from measles and got scared,” she said.